It is a colourless gas with a characteristic pungent smell. Ammonia is an essential compound in industry. Although in extensive use, ammonia is both corrosive and hazardous. 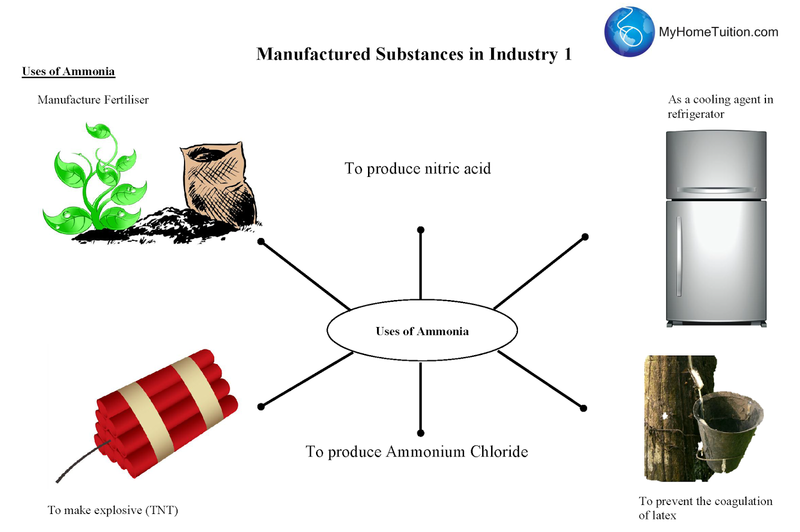 Ammonia is manufactured in industries through Haber Process. In the Haber process, nitrogen gas, N2 from the air is mixed with hydrogen gas, H2 derived mainly from natural gas. The mixture is compressed to a high pressure of 200 atmospheres at a temperature of about 450°C. Iron is used as a catalyst to speed up the rate of reaction. Chemical equation below shows the reaction. About 98% of mixture are converted into ammonia, NH3. The unreacted nitrogen gas, N2 and hydrogen gas, H2 is recycled and passed back into the reactor together with the new source of nitrogen gas, N, and hydrogen gas, H2. Ammonia gas can turn a moist red litmus paper to blue. As an alkali, ammonia can react with acid to form salt and water. Ammonia dissolve into water to form ammonium and hydroxide ion. The hydroxide ion can react with many kinds of positive ion to form precipitate. Ammonia is the only common alkaline gas so it can be identified with moist red litmus paper turning blue. Concentrated ammonia when reacts with concentrated hydrochloric acid produces white fume. Industrially, nitric acid is made by the catalytic oxidation of ammonia over heated platinum. Oxidising ammonia produces oxides of nitrogen which can then be dissolved in water to produce nitric acid. 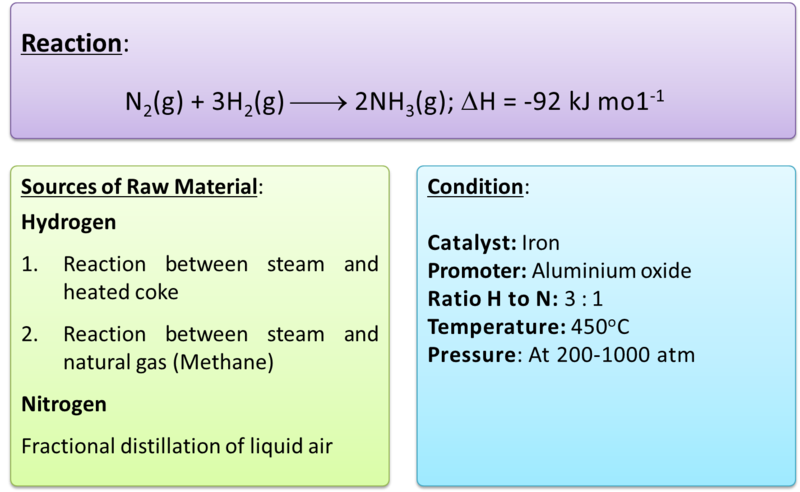 Initially, nitrogen(II) oxide will be formed from the catalytic oxidation of ammonia using the transition metal platinum. The nitrogen(II) oxide is rapidly cooled before combining with oxygen (from the excess air) to form nitrogen(IV) oxide. The nitrogen(IV) oxide, mixed with excess air, is then allowed to react with water to form nitric acid. Most of the nitric acid made is used to make the all-important fertilisers, such as ammonium nitrate. Other uses of the nitric acid include making explosive, like nitroglycerine, or TNT (trinitrotoluene), and making dyes. Modern dyes are azo dyes, which can be formed by the reduction of various nitro-compounds.